Omni wheels or poly wheels, similar to Mecanum wheels, are wheels with small discs around the circumference which are perpendicular to the turning direction. The effect is that the wheel can be driven with full force, but will also slide laterally with great ease. These wheels are often employed in holonomic drive systems. A platform employing three omni wheels in a triangular configuration is generally called Kiwi Drive. The Killough platform is similar; so named after Stephen Killough's work with omnidirectional platforms at Oak Ridge National Laboratory. Killough's 1994 design used pairs of wheels mounted in cages at right angles to each other and thereby achieved holonomic movement without using true omni wheels. They are often used in intelligent robot research for small autonomous robots. 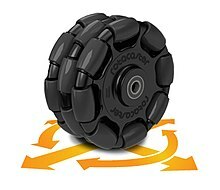 In projects such as VEX Robotics, Robocup and FIRST Robotics, many robots use these wheels to have the ability to move in all directions. 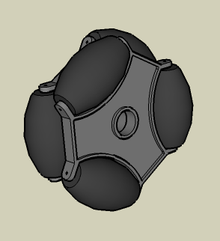 Omni wheels are also sometimes employed as powered casters for differential drive robots to make turning faster. Omniwheels are often used to allow for movement on the horizontal axis on a drivetrain, as well as forward and backward movement. Usually, this is achieved is by using an H-drive. 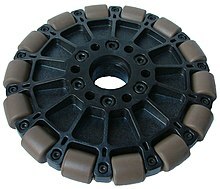 Omniwheels combined with conventional wheels provide unique performance properties, such as on a six-wheeled vehicle employing two conventional wheels on a center axle and four omniwheels on front and rear axles. The wheel was first patented in 1919 by J. Grabowiecki. A variant of the wheel was patented by Josef F. Blumrich in 1972. Blumrich claimed that the design is described in the Book of Ezekiel as a component of a spacecraft created by extraterrestrial life, which is why the wheel is sometimes jokingly called the "Ezekiel wheel". The Spaceships of Ezekiel describes his thought provoking process for the discovery and recreation of the Omni wheel as well as a traveling craft and its docking station. Robotino, used for educational, training and research purposes. ^ "1997 Discover Awards". Discover Magazine. Retrieved 22 September 2011. ^ "EZWheel Mechanics". All Effects Company, Inc. Retrieved September 17, 2017. ^ "The Spaceships of Ezekiel - by Josef F. Blumrich". ^ Kershaw, Jenai (March 29, 2016). "London inventor of new omni-directional wheels says his prototype is better than existing products". London Free Press. Retrieved April 24, 2016. ^ "Hot Wheels". CTV London. Retrieved April 24, 2016. PPRK - A commercial holonomic drive system developed by Carnegie Mellon University utilizing poly wheels. Airtrax - commercial vehicles using mecanum wheels with poly wheels. Wikimedia Commons has media related to Omni wheels. This page was last edited on 2 February 2019, at 01:41 (UTC).